When God created the universe, He established a principle to govern it—the principle of authority. God Himself was the highest authority. Under God were the archangels and under the archangels were many other angels. When man was created, he too was under God's authority. Among the angels which God created was the archangel Lucifer. He was head over all the angels. He was the most beautiful, the most powerful, and the wisest angel ever created. Lucifer's rebellion was against God's authority. He sought to take God's place. 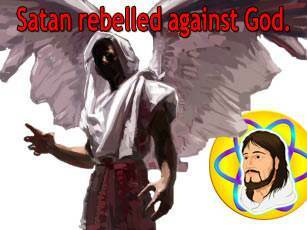 As a result of his rebellion, he became Satan, the enemy of God and the enemy of man. One third of the angels of heaven followed Satan in his rebellion against God. These fallen angels are called "demons" or "evil spirits." Satan, along with the fallen angels, set up a kingdom opposed to God and His kingdom. Ever since that time, there have been two kingdoms in the universe—the kingdom of God and the kingdom of Satan. Prior to Satan's revolt, every created being lived by the principle of obedience to God's authority. But Satan introduced another principle, the principle of rebellion. 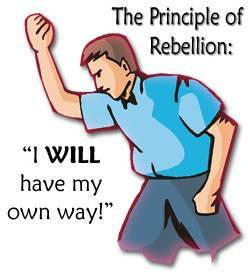 Rebellion is a heart attitude toward God which says, "I will do what I want to do. I will not obey You." God created the first man, Adam, and placed him in the Garden of Eden. Then God created a wife for Adam. Her name was Eve. God's arrangement was that Eve should be subject to Adam and that Adam should be subject to God Himself. Satan desired to put his spirit of rebellion into man, but he did not approach Adam first. Instead, he went to Eve and enticed her into disobeying God by eating forbidden fruit. When Adam knew what Eve had done, he too took the forbidden fruit and ate it. The Bible says that Eve was deceived. But Adam was not deceived. He chose to disobey God. 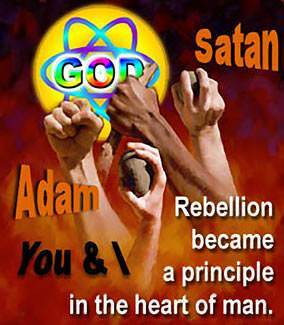 Adam followed Satan in his rebellion against God. He said in his heart, "I will do what I want to do." By the rebellion of Adam, sin entered the world. Adam passed his rebellious nature on to his children and to the whole world. Thereafter, rebellion became a principle in the heart of man. The Bible says, "We have turned every one to his own way." 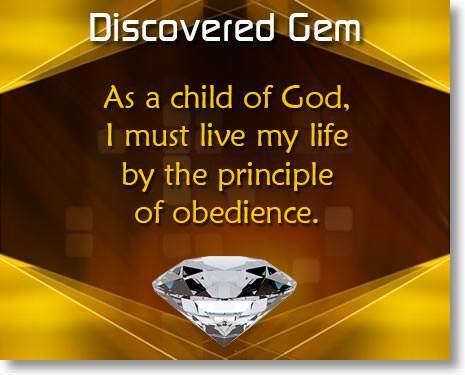 (Isaiah 53:6) This is why the Bible refers to unsaved people as "children of disobedience." After the flood, God established laws and ordained human government. He gave men the authority to enforce His laws. God did this for the protection of mankind. People were so sinful and rebellious that, without some form of government, it would not have been possible to control evil. 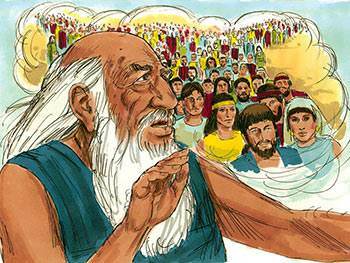 Later, God chose Abraham to be the head of a race of people who would be called God's people. God wanted a people who would be obedient to Him in the midst of the rebellious human race. Abraham's descendants became the nation of Israel, God's chosen people. It was God's purpose that His people be obedient to Him and establish His authority on the earth. God intended that, through the nation of Israel, all the people on earth would come to know Him. But the people of Israel were disobedient and rebellious. God had to chasten them many times. Eventually God allowed their nation to be destroyed because of their continued disobedience. Those who were not killed were taken as slaves and dispersed throughout the world. God created angels, and many of them rebelled against Him. He created man, and man rebelled against Him. He chose the nation of Israel to be His people, but the people of Israel rebelled against Him. 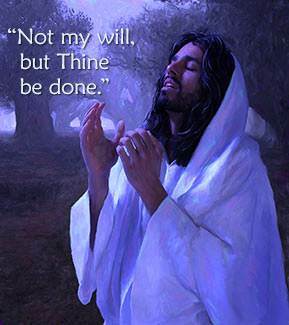 In the Garden of Gethsemane, as the Lord Jesus thought about bearing our sins on the cross, He prayed, "O My Father, if it is possible, let this cup pass from Me; nevertheless not as I will, but as You will." 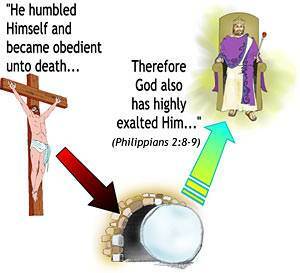 (Matthew 26:39) Since it was the Father's will that He die on the cross for our sins, He willingly obeyed His Father. This man, Jesus Christ, has been given all authority in Heaven and in earth. He has become the Head of a new race—the children of God. Just as He lived His life by the principle of obedience, so we are to live our life by this same principle. The principle of rebellion, which is the principle of Satan. 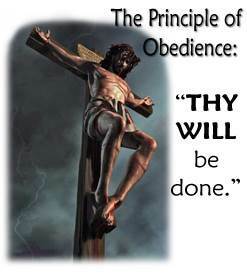 The principle of obedience, which is the principle of Christ. Every person lives his life by one or the other of these two principles. The basic principle of the world is rebellion. This heart attitude of rebellion against God and His authority expresses itself in lawlessness. The Bible says that the world will be come more and more lawless as we approach the end of this age. The basic principle of God's children is obedience.